Helping Traditions is a Biblically-based ministry that was started in the year 2000 by Brian and Marianita Shilhavy in partnership with local believers from various churches and denominations in Quezon Province of the Philippines. The original purpose of the ministry was to reach out to the unreached people groups in remote places of Quezon Province and other places in the Philippines with health, sanitation, and livelihood programs. These tribal areas were often overlooked by most churches that did not have the resources to minister to them. This ministry continues on today throughout the Philippines. Some of the people groups we worked with initially, and still work with today, are the mountain tribes of the Aetas, the isolated island mountain tribes of the Dumugat, and the “gypsy” Badjaos who are displaced Muslims from Mindanao that now make up some of the poorest groups of people in the coastal urban areas throughout the Philippines. The ministry workers who went to these people groups were all Filipino Christians (there were/are no non-Filipinos involved in this actual work in the Philippines). The believers who started this ministry were all from different churches and different denominations. Their strategy was to visit churches near these needy people groups who had a desire to reach out to them with the love of Christ, but were lacking resources. Helping Traditions would fund outreach programs to these remote people groups which included free health clinics, health education, sanitary training, and livelihood programs to generate income. The sponsoring church would then provide at least one part-time, or in many cases one full-time, dedicated ministry worker to follow-up and work on an ongoing basis with the tribe/people group. The Gold Label Virgin Coconut Oil produced for Tropical Traditions grew out of this initial work. From 2004 through 2006 Helping Traditions participated in providing relief supplies and relief teams to Banda Aceh in Indonesia after the devastating tsunami that struck there, wiping out whole towns and killing hundreds of thousands of people. We were probably the only non-Western International teams made up of believers from the Philippines and Indonesia. We brought in container loads of food from the Philippines, including coconut oil, while Western agencies flew in only American type foods. The ministry base there continues on to this day! More about our past projects in Indonesia here. Our base of operation in the Philippines is a registered non-profit company, and run by a board of directors that are 100% Filipino. Today Helping Traditions is assisting ministries in the United States as well. Our goal is to provide healthy, sustainable food systems and make them available to all economic levels, recognizing that those who need healthy food and other health products and services the most, are often the least able to afford them. See our current projects here. Brian W. Shilhavy, BA, MA – Brian earned his Bachelor of Arts degree in Bible/Greek from Moody Bible Institute in Chicago, and his Master of Arts degree in linguistics from Northeastern Illinois University in Chicago. He has traveled extensively around the world and lived in many Asian countries. He was the logistical director of Global Partners in Diyarbakir Turkey after the first Iraq Gulf war in 1991, coordinating the relief efforts among the Kurdish people in southeastern Turkey and northern Iraq. Today he is the CEO of Tropical Traditions, Inc.
Marianita Jader Shilhavy, CND (Certified Nutritionist/Dietician in the Philippines) earned her bachelor of science degree in nutrition in Manila. She also did graduate study at Philippine Baptist Theological Seminary in counseling. Understanding the nutrition of Filipino foods, Marianita worked for over eight years as a hospital dietician and nutritional counselor in the Philippines, using her knowledge of Asian foods to help people recover from illness. 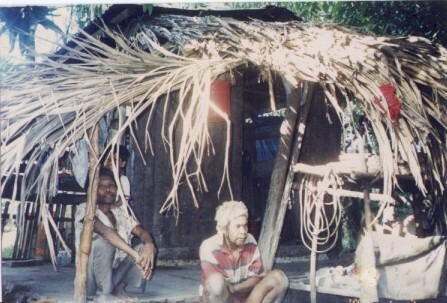 An Aeta Chief with his son in a remote mountain area of the Philippines in Quezon Province. 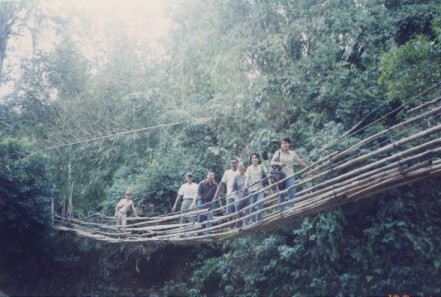 A bridge that Helping Traditions ministry workers had to cross to reach a particular mountain tribe living in the Philippines.